Hershey is a tempting but sticky takeover target for Oreo maker Mondelez. The iconic $25 billion U.S. chocolatier has long belonged with Mondelez’s Cadbury business. Mondelez Chief Executive Irene Rosenfeld appears to sniff sweet opportunity as the charitable trust that blocked bids for Hershey in the past is roiled by scandal, and rival Kraft Heinz is still digesting its own mega-deal. Even so, Hershey won’t come cheaply. 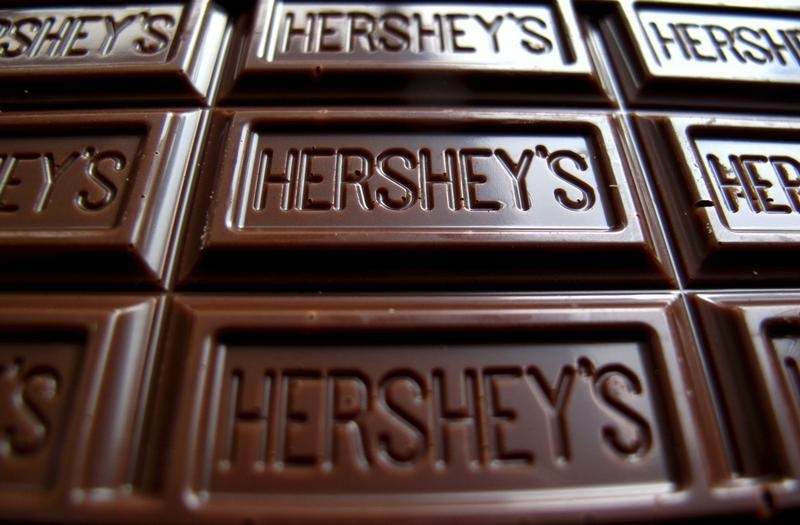 Mondelez’s $23 billion, or $107 a share, offer in stock and cash was rejected by Hershey. A deal at a 30 percent premium to its undisturbed price would value Hershey at $27 billion, or around 28 times 2017 earnings estimates, according to Eikon, pricier than the 22 times that Mondelez fetches. Hershey has rejected sweet offers before. It was nearly gobbled up in 2002 by chewing gum giant Wrigley for $12.5 billion – a 40 percent premium. That collapsed after the Hershey Trust Company, which controls more than 80 percent of the company’s votes, got cold feet. It didn’t help that Pennsylvania’s attorney general sued to block the sale, arguing it would hurt the local community. This time could be different. The trust has been roiled by a series of scandals. Its chief compliance officer was put on leave in May after a memo of his leaked that said the board had spent nearly $4 million investigating conflicts of interest and insider-trading accusations against board members. A top trust official was also fired last month, and pled guilty to wire fraud. The state is also seeking the removal of three trust board members, according to the Philadelphia Inquirer. All of this makes it harder to argue that Hershey would be better off staying under the trust’s control. Meanwhile, Kraft Heinz, another natural buyer for Hershey, is probably still too busy paying down debt from its 2015 mega-merger to mount a counter-offer. And the cost-cutting prowess of Kraft Heinz’s owners at private-equity firm 3G may also raise hackles in Hersheytown. The company may be more susceptible to a takeover offer than any time since Mennonite Milton Hershey, after two failed attempts to build candy businesses in New York and Philadelphia, started making chocolate-covered caramels in Lancaster, Pennsylvania in the 1890s. But for Mondelez, the price of success may leave a bitter taste on its shareholders’ tongues.